Introduced to the market in 1956, the Day-Date has seen a multitude of watch design variations. It is one of the most varied, unusual and creative models the firm has ever produced. 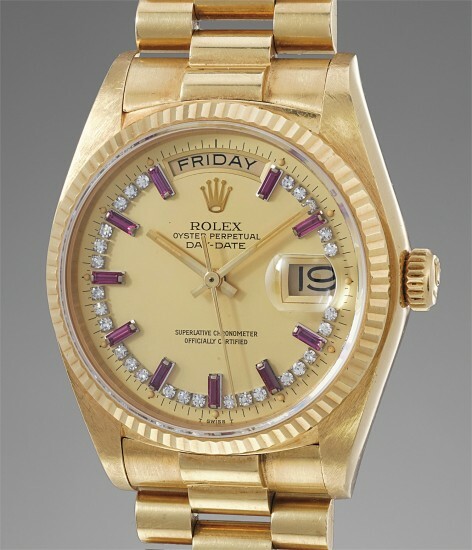 Produced between 1977 and 1988, reference 18038 is characterized by its yellow gold case, bracelet and fluted bezel. The model most notably features a sapphire crystal. It is furthermore distinguished by the diamond and ruby-set champagne dial, giving it an incredibly glamorous edge. Furthermore, the case is preserved in excellent condition with crisp edges and sharp finishes. It most likely has never seen polishing throughout its lifespan. Its provenance is particularly noteworthy, having been sold at the Glamorous Day-Date Phillips Geneva auction on May 9, 2015, lot 27.